These are the original Glenn Cronkhite-designed cornet bags that date back to the 1970s. Some of the original bags are still in use today! Made in the USA using only the finest “Top Grain” leathers and durable 1000D genuine Cordura fabrics, you can be assured that your cornet is well protected in a well made bag. These are the original Glenn Cronkhite-designed trumpet bags that date back to the 1970s. Some of the original bags are still in use today! 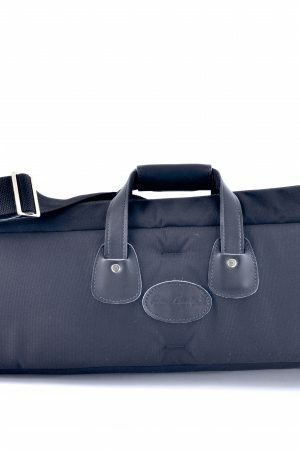 Made in the USA using only the finest “Top Grain” leathers and durable 1000D genuine Cordura fabrics, you can be assured that your bass trumpet is well protected in a well made bag. We’re not kidding when we say this is a SUPER bag. With the capacity to hold up to three horns or a combination of horns and mutes, you will be able to travel comfortably knowing your equipment is safe. In addition to the zippered size compartment of the single bag, the two internal storage pockets of the double bag, this style also features an open side pocket for music. Light, functional, protective and gorgeous – it’s a must have for the versatile horn player on the go! The same high-density foam used in the single bag separates two horns in this stylish version. It also features two internal storage pouches for mouthpieces, valve oil, and anything else you’d like to take with you as you travel. You can rest assured that your horns will be safe and secure while you are on the go. These are the original Glenn Cronkhite-designed trumpet bags that date back to the 1970s. Some of the original bags are still in use today! Made in the USA using only the finest “Top Grain” leathers and durable 1000D genuine Cordura fabrics, you can be assured that your trumpet is well protected in a well made bag.